After the Mortal war and the death of Valentine, Clary’s evil father, Clary is back at home in New York city and training to be a shadowhunter. She’s also able to finally call Jace her boyfriend. Her mum, Jocelyn, and Luke the werewolf are preparing for their marriage. Life couldn’t get better. Then bodies of shadowhunters start turning up- murdered in horrid ways. Somebody who was in the old Clave circle is doing it- so tension is rising and so is the possibility of another war… this time between Shadowhunters and Downworlders. Simultaneously, Jace is beginning to pull away from Clary and she can’t work out why- and she can’t go to Simon because he’s got enough problems. He’s dating a Werewolf and Isabelle the Shadowhunter, and neither of them know about the other. With everything falling apart at the seams, what will Clary do? I loved this so much! The plot was action-packed and unpredictable, with lots of great twists. It was structured brilliantly; the events played out perfectly. I enjoyed Cassandra’s writing so much- her descriptions are brilliant, and a lot of the dialog witty. I enjoyed reading about the new antagonists to the story- Camille the Vampire and Lilith, the oldest demon. They were absolutely terrifying, as was Lilith’s plot to bring the evil, demonic Sebastian; Clary’s heartless brother. I don’t think any other author could pull off having two evil-power-hungry-antagonists, both with different intentions, in one book! Clary, in my opinion, did not develop much at all in this fourth installment. Of course, I still loved her as the main protagonist, but i fell that she could’ve chipped in a bit more with the fighting. This book was more about regaining her love for Jace after the difficulties they’d faced in City of Ashes and City of Glass, and as much as I enjoyed that, i think she could have fought a bit more (Yes, she was restrained by an evil demon dog in the final battle, but I would’ve liked her to fight it a bit more!). I think Jace’s personality was a bit more in-depth in this book than in a couple of the previous ones. The whole possession issue with him made his emotions for Clary shine through much clearer. And finally, Simon seemed to have a much bigger part in this book than I thought he would’ve. In fact, there was nearly as much of his story than there was of Clary’s. I liked having him become a more major character than before, though. He really developed in this book into a more confident character. I noticed a love triangle between Maia (a werewolf), Simon, and Isabelle (Jace’s sister) at the end of City of Glass. It was really interesting to see that become bigger and create multiple issues in City of Fallen Angels! 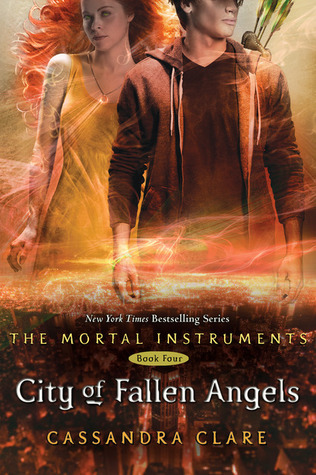 In total, City of Fallen Angels was a brilliant read. It was thrilling and captivating… I couldn’t stop reading. I found it really clever how Clary found herself in Simon’s life-or-death situation towards the ending. I love Cassandra’s writing so much, and really wan’t to read about what happens to Camille- so I can’t wait to read the next: City of Lost Souls! This entry was posted in Uncategorized and tagged fantasy, romance on April 4, 2013 by keithbwalters. City of Lost Souls isn’t the last one! The last one, City of Heavenly Fire, comes out in April 2014. AAHHH!!! I didn’t realise!! *fangirls* Thank you, Lucy, you’ve just made my day by telling me that Lost Souls isn’t the last one 😀 And yes, I think this was possibly my favourite, too.